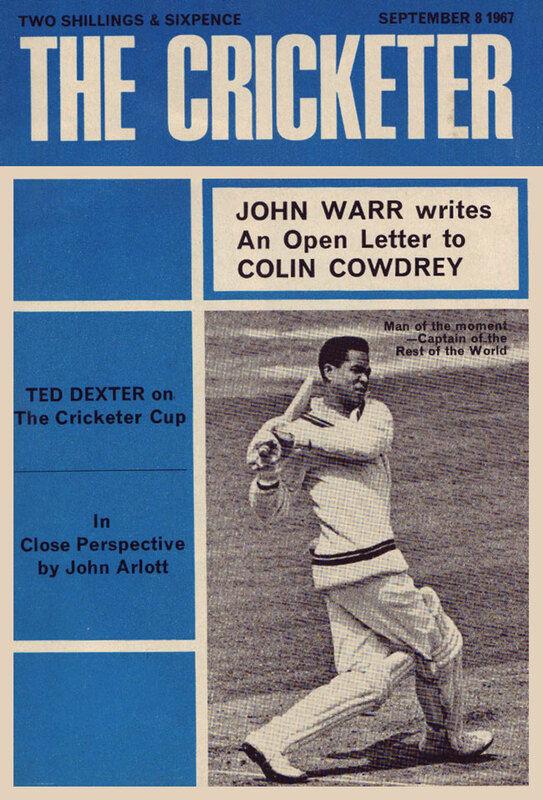 As The Cricketer magazine nears its century in 2021, it is worth recalling some of the great names who have taken it there. They include Sir Pelham Warner, the former England captain and MCC grandee, journalistic titans EW Swanton and Christopher Martin-Jenkins, and the current editor Simon Hughes, the former Middlesex seamer and acclaimed author. In 1938, a year before World War Two, EW Swanton makes his first contribution – a report of The Oval Test against Australia. His journalism career is put on hold when he finds himself a prisoner of war in camps along the Burma-Siam Railway. The magazine soldiers on during the War, with the editors driving through a Blitz-torn capital on a monthly basis to take the pages to the printers. Ben Brocklehurst, a farmer and former Somerset captain, joins Mercury House publishers, which acquires The Cricketer at his instigation in 1962. Warner then stays involved until his death in 1963, when his son, John, becomes editor. In 1967 Swanton becomes editorial director, and in the same year, Brocklehurst founds The Cricketer Cup – the knockout competition for old boys of public schools. Mercury House’s American managing director decides to shut down The Cricketer for lack of profit in 1972, so Brocklehurst buys the title himself, running it with his wife Belinda from their home near Tunbridge Wells. That year The Cricketer also founds the Village Cup (which it still organises to this day), and the Lord’s Taverners Colts Trophy for under-15 school teams. The Cricketer is enjoying a spike in its circulation at this time, up from 15,000 after absorbing the rival Playfair Cricket Monthly. David Frith becomes editor, with Swanton editorial director. Brocklehurst later adds a profitable travel arm, Cricketer Holidays, to the business. In 1975 Brocklehurst suggests the idea of a men’s World Cup to MCC; they embrace it, although they reject the idea of The Cricketer being involved. In 1977, to celebrate the centenary of Test cricket, The Cricketer picks all-time England and Australian XIs. Frith has to step in as peacemaker when the debate becomes heated between Swanton and John Arlott. The XIs are England: Grace (c), Hobbs, Hammond, Compton, Woolley, Rhodes, Ames, Laker, Barnes, Larwood, Tate. Australia: Trumper, Simpson, Bradman (c), McCartney, Harvey, Miller, Trumble, Oldfield, Lindwall, O’Reilly, Lillee. In 1979 Reg Hayter – founder of the legendary Hayters Teamwork sports news agency – comes in as editor. Two years later he is succeeded by CMJ, a previous assistant editor to Swanton. Circulation peaks at around 45,000 in 1984, and it is estimated that 30,000 players have taken part in one or more of The Cricketer’s competitions in Britain. In 1991 Swanton names his greatest XI from the 70 years of The Cricketer: Hobbs, Gavaskar, Bradman, Headley, Sobers, Miller, Davidson, Evans, Marshall, O’Reilly, Gibbs. It is all change in 2003 when the magazine is bought by Wisden and becomes The Wisden Cricketer, merging with Wisden Cricket Monthly. The editor is John Stern, who stays until 2011. Seven years later the magazine is bought by Test Match Extra, with Lord Marland of Odstock and Neil Davidson, the former Leicestershire chairman, principle investors. Andrew Miller becomes editor, and the magazine reverts to The Cricketer again. A new era begins again in 2016; Simon Hughes becomes editor, with Huw Turbervill managing editor. The quest is still the same, though: to produce the best magazine, featuring the finest articles by the game's greatest writers, with news and views, and wonderful photography. Here’s to the next 96 years.